The internet is a great place. People who use it can be unbelievably supportive; perhaps too supportive. Posting my work onto Facebook seemed like a good idea, but I quickly learned that it wasn’t really beneficial to me. There was the whole issue of ownership of images, for one. There was also the issue of the lack of truly beneficial feedback to my work. This is going to sound horrible, but sometimes generic compliments don’t really help one grow. That is a great photo, is something you see a lot (not just for me, in case you are about to pop my seemingly inflated ego with that pin in your left hand), but how much does a compliment like that really help? Why is the image good? Is there something that the photographer could have done better? Is there something in particular that speaks to you? Something that you would like to share? After I pulled my “professional” photos from Facebook, I started working harder on populating my photography blog. Quite a number of images went up, all with their own stories and documentation about what settings I used. And then I stopped, for various reasons. When I recently started up again, I thought I would regret the hiatus; however I am really glad that I had that break. Being away for a while has given me a fresh perspective, and to that end I have been going through my portfolio and getting rid of images that may only be there because of a newbie’s enthusiasm: the fire of excitement stoked by compliments from very nice people. To date I have removed about 40 images, with more in the queue for evaluation. I suspect that the portfolio will probably lose about 10 to 20% of its content, and this is just fine with me. As a friend told me, you want to show people the best of your best work. I completely agree. It is my sincerest hope that none of you that read this piece are offended in any way. You all help me by keeping me excited about the art that I like to pursue in my spare time. I truly do appreciate kind words you all spare. I just feel that, despite all the kind words, I can be a better photographer. Hopefully this isn’t all bluster and that I can blow you all away with even better images in the future. Back in 2001, Mrs. Jorge gave me a most generous engagement gift. 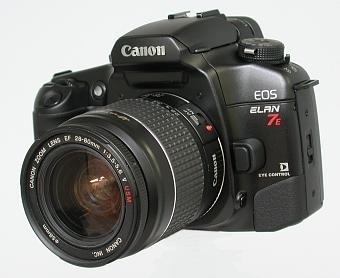 It was a Canon EOS Elan 7E; a wonderful SLR with the ability to track your eye to focus on various parts in your field of view. It was a great gift. It was an expensive piece of technology that was very much worth it, as it granted a great deal of control over composition. It was also something that I had wanted for a while, and was carefully saving up for (I ended up buying another lens for it later on with part of that savings money). It really helped me grow as a photographer, as it was a challenge to learn how to use properly (I still don’t know if I ever managed to use it to its full potential), and it gave me more confidence to know that I had really great optics at my command. I used the hell out of this thing. I have been very meticulous about keeping track of all of my negatives, scanning them for printing and filing them in protective sleeves and storing them chronologically in binders. I entered exhibitions and photography festivals, knowing that this camera would help me capture what I saw with my eyes and share it with people the way that I wanted to. But nowadays digital photography seems to be far more popular than film. The place where I used to take my film to be developed (Film processed, copies on CD, index print, uncut negs), has changed their hours. I also find the quality of negatives coming back from most places increasingly poor. Streaks on the negatives, lots of fingerprints, scratches and the like. It’s as if nobody really cares about film anymore; it seems like nobody cleans the machines. Even scanning the photos with the dust/scratches filter doesn’t compensate for that sort of thing. The last straw was when I was doing a shoot for a friend. The photos were good but the negatives were covered in streaks. I had to spend quite a lot of time in Photoshop cleaning it up, which was very frustrating as I took great care when I took the photos to do my best. This thing is incredible. There is so much functionality built into it that it makes one’s head spin. 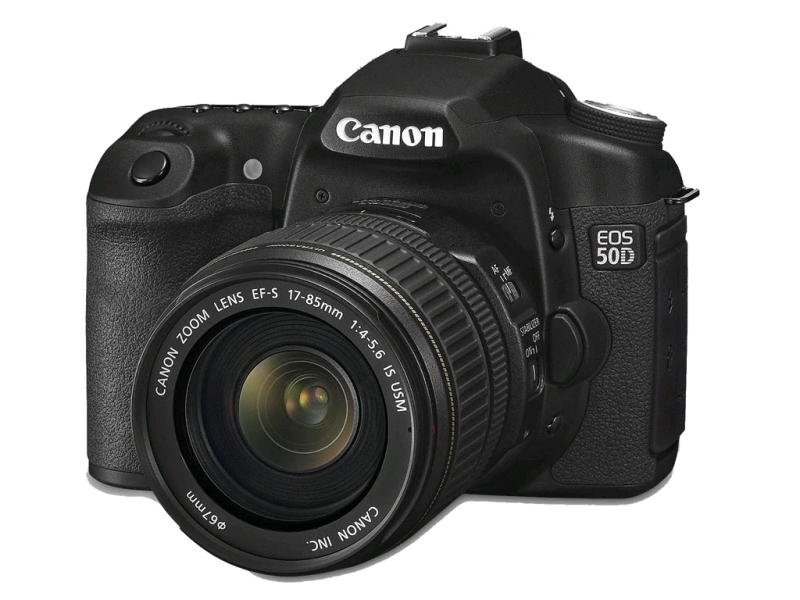 While not a 5D or a professional camera, it will allow me a high degree of control and creativity with my shots. The bonus, of course, is that the viewing screen built into the back will give me the chance to review the photos that I take and make any corrections if necessary. It also came with a 17-85mm 4-5.6 IS lens. The Canon IS (Image Stabilized) lenses are awesome. While not eliminating the need for a tripod, for those of us with steadier hands it is a powerful tool. I tested it out by shutting off my flash and opening the aperture as much as possible to take a photo of a friend’s painting in a dimly lit room. The results are breathtaking. It has been a very hard decision. 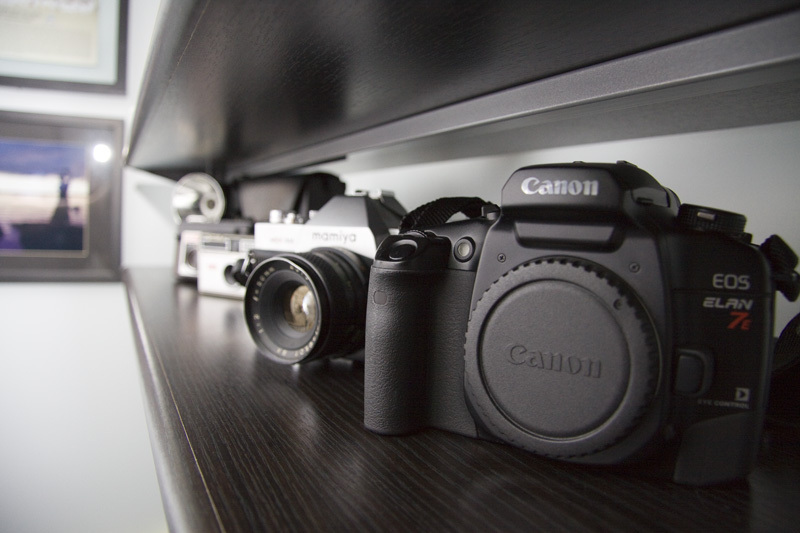 On one hand, the camera that Mrs. Jorge gave me was instrumental in my development as a student of photography. However, it is harder and harder to justify paying for film when the results are not as good as they used to be. Also, the inconvenience of developing film is very apparent when you have a child. In 2009, I took 5 rolls of shots. For those who know me, this is definitely below the average. I am looking forward to getting acquainted with my new acquisition. I am very sure that this will bring back the means by which I can pursue something that I am very passionate about.